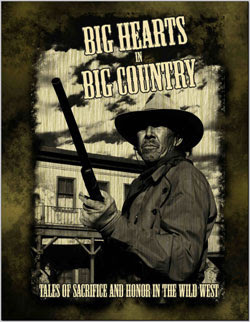 Big Hearts in Big Country by C.C. 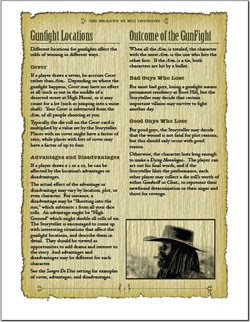 Chamberlain is a wild west roleplaying game that aims to replicate the iconic themes of western movies. Big Hearts has one of the best gun fighter mechanics I've ever read, is beautifully presented and you cannot help become engrossed in the love and attention that has gone into it. I can't see you ever needing another Wild West Game. Characters in Big Hearts are those heroic, historic do-gooder types. There's filth all over the west (some would argue there still is!) and you are sent in to clean it up. Characters are not specified in Big Hearts, instead they are simply acted. If the GM can describe three words about your character then the difficulty changes given an action. For example, if you have been portraying your cowboy is tender, poetic and quick on the draw and doing so consistantly then the GM will give you a beneficial modifier for seducing the female owner of the saloon. I have mixed feelings about this mechanic as a replacement to character definition. On one hand it coaxes players into playing a coherent, consistent archetype (something I am in favour of). However it puts a great onus on the player to decide the precise style of their character before play and restricts them from modifying during play to fit into the team. The GM sets a target number, 10 being the start. You're aiming to roll over that. If your character is believable, you get a negative (beneficial) modifier. The player can then deliver an Acting Job, which urges the player to perform the scene, adding futher modifiers. The dice are then rolled and if the outcome is dreadful then you can spend Goodwill or Clout*. Goodwill is a representation of how much of a good guy you are and is represented in white poker chips. You can only use Goodwill in positive, 'Good Guy' interactions. A player performs another Acting Job and the GM decides how much Goodwill needs to be spent to pass the check. You use these chips to reroll the dice you don't like. Goodwill can also be used to wrestle control of the narrative. Clout is represented with Blue chips and performs the same object but is used when you want to be mean. Gun fights are a an entertaining physical affair. You sit on one hand, put the other on a deck of cards and then stare down your opponent. You overturn the cards in your deck, some face up and some face down and then when you think you've got a high value series of cards then you start turning over all the face down cards, roll dice and then reach for a bandana in the middle of the table. Exciting stuff. I'm butchering the brilliance here. As a favour to C.C., please do download Big Hearts and give it a read. Then give it a play. Without me needing to blither on about a lack of setting, C.C. 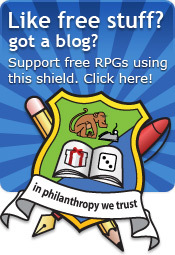 has kindly provided a sample adventure! A sample adventure! Let me exclaim thrice: A sample adventure. And by goodness it's a goody. It's got everything in there: bad baddies, good goodies, a mission, a mercantile and splendid description all. C.C. has also provided plot hooks. To my overspilling delight C.C. returned to his 24 hour concoction and tweaked, expanded and painted with more grace than was possible in the first 24 hours. The original 24 hour core was excellent but the revised edition is a more polished delight. The layout and graphics are excellent and although it makes for slightly daring printing (a toner killer) the effort that went into giving the book real flavour is obvious. 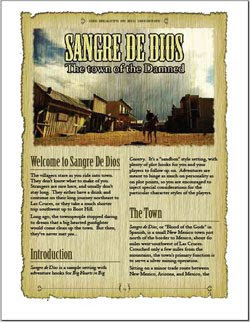 I would like a character sheet, not for statistics perhaps but instead for recording derring dos, bounties collected or gunfights won. Some kind of record. Perhaps a criminal record? Perhaps a place to record Clout and Goodwill between sessions? Just something. I would like the background to be a shade or two lighter to improve contrast and reduce the toner bashing on printing. Oh and I want another version. Bigger. Better. 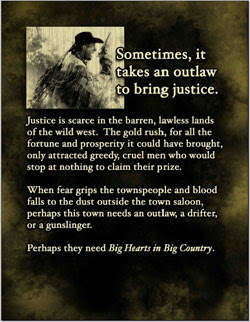 Big Hearts in Big Country is an innovative Wild West game that goes above and beyond the call of duty. Mechanics and setting are woven together inextricably. I would happily set C.C. 's game on a pedestal as an example of why you should carefully craft a mechanic to support and uplift a setting. A superb work, many thanks for sharing it with us, C.C. * I chortled merrily with nostalgic reminiscence when I read 'Clout'. Back when I pretended to attend University, a friend once festered a vat of homebrew 'beer' under the stairs of his dank Victorian townhouse. He referred to it as "Clout". Rightly named too, it managed to floor a mountain of a man whose unenviable party trick was to drink a pint of his own vomit and sing God Save the Queen. Thanks for reviewing the game! If anyone plays the game, I'd love to hear a play report. I'd like to echo CC, if anyone has an actual play report then please let us know! Ah, reviewy goodness, yesyesyes! I must say that the only reason that I'm not running this one for my gaming group is that I'm hoping somebody else will. Great work, CC!